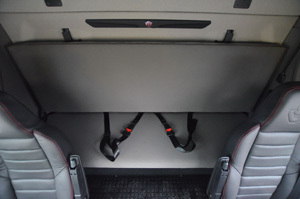 The majority of standard truck cabs are fitted with two seats: one for the driver and one for the co-driver. To augment the product range, ESTEPE offers a large number of interior modifications that vary from fitting extra seatbelts & seats to installing additional beds and customer-specific modifications. These modifications are completely suitable for various transport segments and applications. 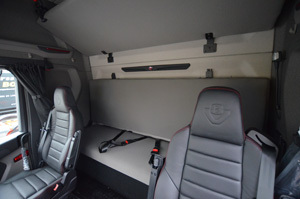 For the application in the flower transport a vehicle has recently been converted with 2 extra seats and 3 beds. This ensures that drivers can alternate with each other, because there is no time to waste in the flower transport. To create a better seating position while maintaining optimum comfort, the original bed has been converted into a narrower “crewbench” that offers space for 2 additional passengers. 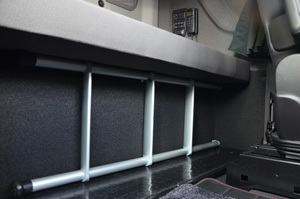 The back wall is reinforced to secure the 2-point seat belts and the two ESTEPE beds. The multifunctional folding bed also serves as a backrest and can easily be folded up and down. The top bed has a fixed position and can only be folded upwards. 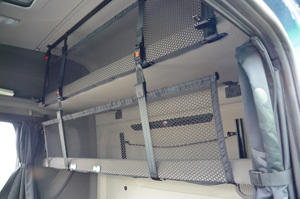 To ensure the safety of the passengers, two safety nets have been attached to the folding bed and the upper bed. In addition, we have supplied a compact and removable ladder in consultation with the customer, so that they can easily get in and out of the upper bed. Would you like to know more about this specific solution? Come into direct contact with our interior specialist at sales@estepe.nl. Looking for another solution? Feel free to contact us as well.